The mail-order business is a fabulous one. Pick a product or service the public wants and the world is your oyster. YOU’VE heard about the salesman who was such a slick operator that he made a fortune selling refrigerators to Eskimos. Well, Hugh Clay Paulk made his pile peddling parachutes to old ladies. No, Paulk is not an ace confidence man, hasn’t sold municipal structures to visit- ing firemen. And neither did nice old ladies go around parachuting from airplanes after he got through with them. He simply became a shrewd operator in a fantastic game —the mail-order business. He bought up 50,000 surplus service chutes little by little and advertised them for $13.95 each. Thrifty housewives immediately spotted the bargain and flooded the mails with $800,000 worth of orders! They cut up the chutes and made dresses, shirts and assorted wearables for the family from the fine quality nylon. Paulk is by no means the only one to cash in heavily in the mail-order business. You’d be amazed at the number of small operators who are making large money. Thousands of ex-clerks, school teachers and mechanics are packing items from morning until night in their kitchens, attics, garages and cellars, lugging them to post offices and depositing in the bank the fist-fuls of checks dumped on their doorsteps by the mailmen each day. Mail-order experts estimate that the little guys who advertise and sell just a few products do a gross business running close to a billion dollars each year. And that figure does not include the astronomical sales racked up by the mail-order giants like Sears, Roebuck; Montgomery Ward, and others. Those little guys, who sell exclusively through advertisements, are outposts of free enterprise wherever they operate. 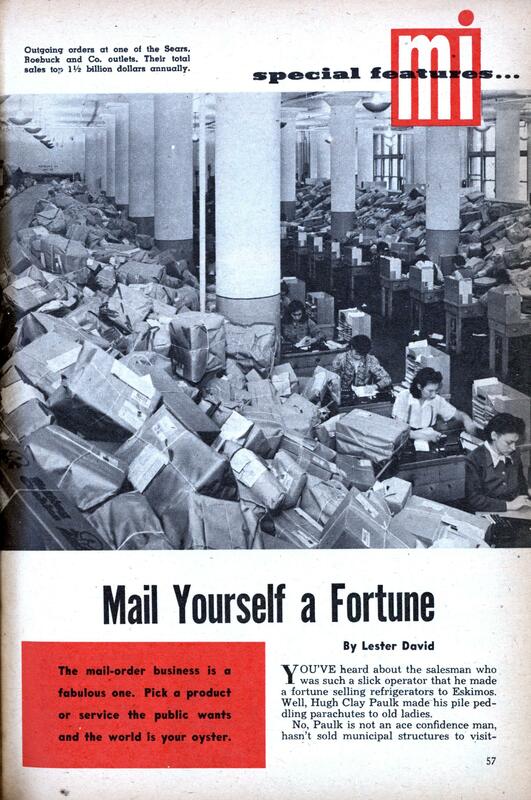 The ads take the place of store counters and sales clerks; the post office takes the place of delivery trucks. Criss-crossing the country are their products—a bewildering variety of anything and everything that can be mailed, from baby crocodiles to rose bushes, from ant houses to antique jewelry. And the amazing fact is that the little guys, who started just a few years ago with nothing more than one item, a tiny stake and a prayer, are fast becoming big guys. Look at young Hal Zimmerman of Montgomery, Ala., who spent his off-duty hours while he was in the Air Force organizing a business selling inexpensive watches by mail. Today, at 31, he runs the American Merchandising Company, one of the fastest growing mail-order houses in the country. Says Hal: “As proof that you don’t have to have a lot of money to start, I began my business with a little money saved as a buck private and believe me, that was no fortune!” His first expense for advertising? A flat $16.80! Then, there’s the case of Charles C. Gilbert of San Diego, Calif., who began five years ago and now calls himself the world’s largest supplier of hydroponic information, equipment and materials. Hydroponics, a soilless method of growing plants, was generally misunderstood, Gilbert discovered. It was clouded by all sorts of technical gibberish. Gilbert thereupon set out to make the field so simple that any schoolboy could enjoy it as a hobby. He began selling seeds and a book called Success Without Soil. The business caught on so rapidly that today, during peak months, he does a $350 daily volume of business. Look at the firm of Harry and David on the West Coast. They began advertising and selling just one product, the luscious pears that abound in the orchards of Oregon. The country took a few bites, then began bombarding Harry and David with orders for more. Today they employ more than 1,000 persons in a mammoth Fruit-of-the-Month-Club enterprise which sells more than a million dollars worth of fruit products annually. Let’s take just one more look, this time at a couple of little guys who began a while back. One of them was named Richard, a station agent and telegrapher in the tiny Minnesota town of North Redwood. Way back in 1876, Richard began peddling inexpensive timepieces to some of his friends and co-workers and kept at it for a decade. Expansion came next; Richard moved to Minneapolis and established a watch and jewelry business. In 1887, the second little guy, a watch-repair man by trade, joined the business and in 1893, the two men sold out and established another firm with the basic idea of supplying various items for customers living far removed from large trading centers. The rest of the story is history—real, living history of American enterprise. The names of the two little guys? Mr. Sears and Mr. Roebuck! 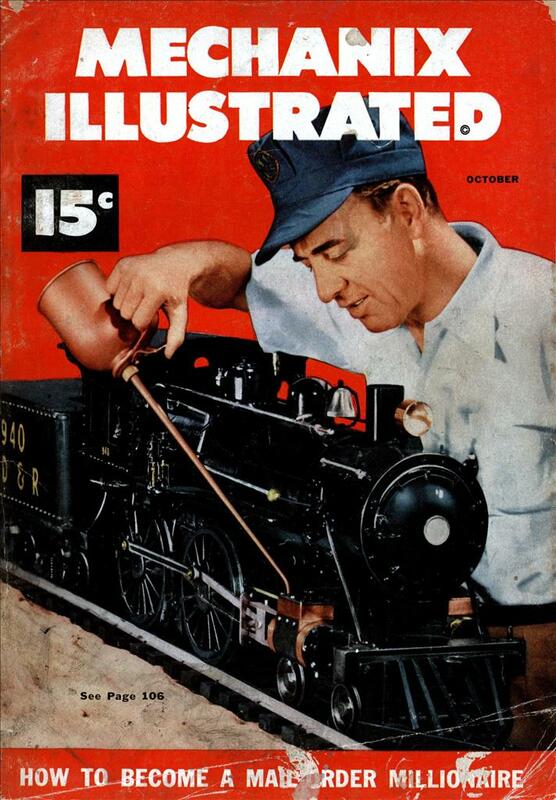 Today, the company they founded issues about seven million catalogues twice a year, bulky as telephone books, with total merchandise sales topping a billion and a half dollars each year. One of the most unique—and most successful—mail-order houses in the country is the one run by the fabulous L. L. Bean, whose place of business is conveniently located over the post office in Freeport, Me. Generations of explorers, big game hunters and just everyday sportsmen have helped build Bean’s business into a $1,500,000 a year enterprise. Here’s how he did it: About 40 years ago Bean found his own feet got tired and sore on hunting expeditions. He decided the h^vy lumberman’s boots he wore needed some changes so he tried wearing ordinary rubbers over three layers of stockings. It worked fine—they kept his feet warm, dry and comfortable. Later, he had leather tops sewn on for ankle supports and began selling them. They were the basis for the business and still rank as his leading seller. Since then he has added sportsmen’s equipment ranging from fish hooks to tents and doesn’t consider an item saleable unless he finds by actual test that he would select it for his own use. Thus he can advertise a pocket fish knife: “The hook disgorger which locks open is the best I have ever tried.” Personal testimonials accompany all his items and they have made Freeport, Me., a familiar address to sportsmen everywhere. Figure it this way—your customers are going to buy your item because they can’t get it locally and because they will save money. There’s no sense in offering something that they can get simply by walking into a store on Main St. Tom Gardner of Milwaukee, Wis., sells fluffy wool dusters— but a very special kind. They come right off the backs of Australian sheep. Gardner saw them there when he was a Navy lieutenant during the war. He imported batches and they sell at the rate of 1,000 a month. If you have a real specialty of your own —an unusual trinket that you can hammer out in your workshop, a unique taste sensation from a family recipe, a little invention you’ve been harboring in the back of your mind—you can get going. Bob Mc-Farren of Corona del Mar, Calif., buys up wholesale lots of plain, unadorned china cups for a few pennies each, then paints designs and characters on the surface with a mixture of ceramic paint and an oil base of his own concoction. He then glazes and rebakes the cups in an electric kiln and sells them for $1.50 each. One college student utilizes his jigsaw to make small cabinets of unusual design. A North Carolina family carves old-fashioned salt shakers and pepper mills. An unusual type of make-it-yourself kit is always in demand—things like sew-its for the kids, jewelry crafts and modeling assemblies. C. B. Shuman of Kent, Ohio, devised a kit which enables anglers to. make their own fishing lures by pouring liquid rubber into a mold, allowing it to dry and putting it on a hook. Merchandise is by no means the only product. You can sell information—anything from tips on how to make money to technical tomes. Witness the enormous success of how-to books and the correspondence schools. In the latter category, there’s the story of Thomas J. Foster who edited a little mining sheet in Shenandoah, Pa. He was struck by the immense popularity of a question-and-answer column he was running on mining. Why not start a school by mail, he asked himself, to supply vital knowledge to miners all over? He began with less than $100 capital and by the end of a year had 1,000 pupils who were paying $25 each for his mining course. Today this institution, International Correspondence School, has become world famous, has a larger enrollment than any university in the world and a total of 3,000 employes here and abroad. You can also sell your services, whether they are clerical, technical or professional. 2. WATCH your promotion. No matter how attractive your product may be, it’s of no value unless you bring it properly to the attention of your potential customers. In order to do this, you must become intimately acquainted with your product. You can also get much free, valuable information from the appropriate governmental agencies, experimental stations and technical institutions. Bone up on advertising techniques. Learn how to pick a significant point to play up, how to dramatize your selling features, how to pique the emotions, how to appeal to the basic needs and desires for health, wealth, security, knowledge, power, love, self-preservation. Pore over the mail-order ads in the magazines and newspapers and see how others do it. 3. WATCH your mailing list. Many mailorder beginners, feeling they can’t afford magazine ads, buy ready-made mailing lists. For a few dollars, brokerage houses will either sell or rent lists of names grouped according to specific classifications. A listing of name suppliers can be obtained from the Direct Mail Advertising Association, 17 East 42 St, New York 17, N. Y. Lists cost from $10 to $35 per thousand names and they come in all groups—business men and women, fruit packers, barbers, butchers, bakers, florists, beauty shops, college professors, clergymen, teachers or other mail-order buyers. There certainly will be a list of persons specially interested in your product. There are many other vital things to know and study before launching a mail-order business—the prices to pay for your items, figuring your mark-up, how to maintain files and records, what to say in your literature, the laws of the Post Office Department, Federal Trade Commission and other Federal departments. All of these tremendously important details are fully covered in the Department of Commerce booklet, Establishing and Operating a Mail Order Business, which can be obtained by sending 30 cents to the Superintendent of Documents, Government Printing Office, Washington 25, D. C.
One final caution: don’t expect to start a business, then loll in the shade of the old apple tree waiting for the postman to drop sackfuls of dollar bills. There have been— and will continue to be—hundreds of rags-to-riches heroes but not one hit the jackpot without thorough study and hard work. Start on a shoestring? Yes! Make big money? Definitely! But, a lazy man’s game? No! Somehow, people love to send money by mail. L. D. Paulson, a sales promotion man of Louisville, Ky., recently tested this by sending out a batch of form letters all over the country. They quite simply begged for money. He got 400 replies, each containing cash! Paulson, who was experimenting on a new sales promotion idea, returned the money. But he had proven that people just love to send dough in the mail. Is it already parcel-avalance season?